Just as picture/described. Love it! 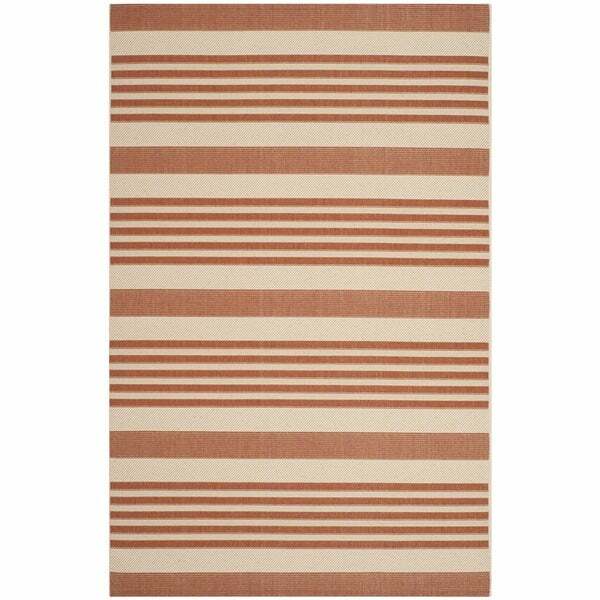 Safavieh Courtyard Stripe Terracotta/ Beige Indoor/ Outdoor Rug - 5'3" x 7'7"
Safavieh Courtyard Stripe Terracotta/ Beige Indoor/ Outdoor Rug - 4' x 5'7"
Safavieh's Courtyard Collection creates a dynamic presence with its fashionable and transitional designs that are suited for both indoor and outdoor settings. These rugs have been expertly power loomed of enhanced polypropylene to create intricate motifs and ensure a comfortable surface underfoot. For outdoor use, this rug will turn your deck, poolside, or patio into a resort-style entertaining space. Featuring a main accent color of terracotta, this rug is in vogue with its tasteful and bold modern design. This rug's striped nautical vibe makes it a prime candidate for outdoor use on the patio and its durability is perfect for a kitchen, eating area, or playroom. Dimensions 8 ft. x 11 ft.
We've had this rug for about a year now, and it has held up perfectly. The color has faded just a bit, which is better than expected considering it is placed in the sun. This is a nice, high quality rug, that looks good on my cement patio. It is just the right size for a rectangular table with 6 chairs. As mine is exposed to the elements, I expect it to last about 3 to 4 years. Very attractive, but ended up very faded and mildewed on our patio. I'm sure it would have held up great in a covered area. So, my advice is to not take the "outdoor" part of the name too literally. But it was probably wishful thinking on my part to think otherwise. "Do you have this rug in a red color?"